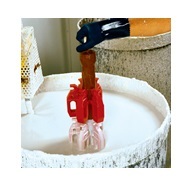 During the process, these wax molds are melted away as referenced in the name given to this technique. Though not always the most economical option, lost wax casting allows for the creation of complex precision parts with little to no need for secondary operations, a fact which in many applications is highly cost effective. The lost wax casting process creates a surface that mirrors the wax form and is thus seamless with no flashing or parting lines as the part is created as one whole piece. Furthermore, as the wax model that gives shape to the mold is the exact size and shape as the part, wax casting provides a highly accurate part. This manufacturing process has traditionally been used for centuries in the jewelry making industry, though scientific and manufacturing advancements render it essential to a number of applications including dental and medical tools, engines, couplings, fittings, pipes, propellers and in aerospace, automotive, dental, medical, electrical, construction, mining, food processing, telecommunication, plumbing, military, sports, and other industries. Fortunately, the lost wax casting process is as versatile as its applications and almost any metal that can be cast can be formed in this way from aluminum, copper, and stainless steel to gold, titanium, and brass. Lost Wax Casting Process – Rimer Enterprises, Inc.
Manufacturers with a good working knowledge of the chemical and molecular composition of the materials used to create the wax pattern, molds, and finished parts can manipulate the process to bring out desirable traits such as durability and weight load while diminishing unwanted features. Such details must all begin with the creation of the wax pattern itself, known as the master die. The wax can be carved by hand or machine, though it is not uncommon to use injection molding in more automated settings. Before processing goes any further any flaws or imperfections must be removed to ensure the mold is as close to the final form as possible. A heated metal tool is then used to attach this die or pattern to a wax rod known as a sprue. In some cases, several hundred patterns may be attached to the same sprue. Such assemblies are known as trees. The sprue or tree is then dipped several times into a ceramic slurry called the investment. Alternatively, the patterns may be placed in a flask that is then filled with the slurry. When the desired thickness is achieved, the investment is cooled until hard at which point it is placed upside-down into a furnace or oven. This is where the wax is lost. The heat causes the wax to melt and run out leaving a completed mold of the desired part. 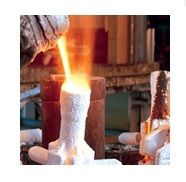 After being subjected to high temperatures to eliminate residue or moisture, molten metal is poured into the hollow shell. Once this cools, the cast is removed, often destroyed, to reveal the finished part or component. Lost Wax Casting Lost wax casting, also known as investment casting or wax casting, is a popular metallurgical process involving the creation of industrial parts and components through the metallic replication of wax molds.